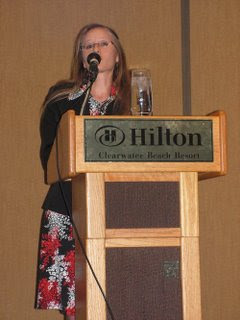 When Ariane Kirtley spoke to Montessori teachers at the International Montessori Council's Peace Academy conference in Clearwater Beach, Florida in 2006, students presented the project alongside her. Ever since that time, students around the world have been working as partners with Amman Imman. 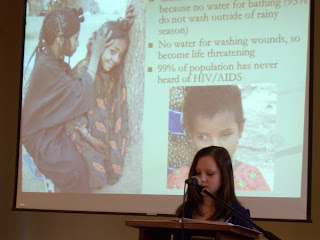 Students have made presentations within their own school communities and also taken the project to other schools. They have participated in collaborative fundraising activities like A Walk For Water, and also initiated their own fundraising projects. Not only is the Amman Imman project impacting children in the Azawak of West Africa who now are beginning to gain access to sustainable water sources, but it is also affecting students worldwide by providing an experience through which they can be activists and make change happen. My school helps a program called Amman Imman. Amman Imman's goal is to bring water to Niger, West Africa. So far in 2007 we were able to raise enough money to build a borehole and help 25,000 people. A borehole is like a well, but it is deeper and is a shaft that brings the water up. In February I was lucky enough to go to The Hershey Farm School in Ohio with the other seventh graders in my class (Sarah Nia, Ashley, Sophie H-S, and Dylan) to present about Amman Imman. Also, on my own, I decided to present to some three to six year-olds at Manor Montessori in Bethesda, MD. I have enjoyed all that I have done for Amman Imman and look forward to the upcoming year to help even more. Our school is sponsoring a project named "Amman Imman." Ariane Kirtley is the founder and program director of "Amman Imman, Water is Life." Ariane speaks with such compassion about the children and adults in the Azawak, Niger's most remote and abandoned territory, covering 80,000 square miles and inhabited by 500,000 people. There are barely any roads, dirt paths, schools or health centers, and most importantly there are no permanent sources of water. Amman Imman's mission is to help the water situation by building permanent sources of water throughout the territory.Ariane came to our school in the beginning of last year's school year (2006) and spoke with such compassion about her experience and lack of help from world organizations. At first she tried to get support but was told that no help could be given. She did not take no for an answer. 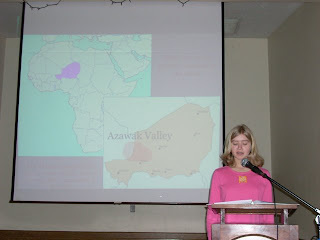 Instead she started traveling around in North America spreading her word about the lack of water, the people of the Azawak Valley and the need for financial support. She was very knowledgeable about her topic and convincing. She made us all feel we needed to take part in raising funds. She made me believe I can help change the lives for these people. My school helped spread the word to other Montessori schools around the country and the world and with their help we raised enough money to build the first bore-hole. There are still many bore-holes to build. Experience changes the course of our lives. For these students, these experiences have altered their perception, and possibly their future choices. As they embark on the path toward adulthood, who knows what seeds of life Amman Imman will sprout? If any of your students have written about their experience in working with Amman Imman: Water is Life to help the people of the Azawak, please write and let us know. We would love it if they were willing to share their work, ideas and experiences with the Montessori community. This is pretty nice stuff. I am sure this will benefit lot of folks.